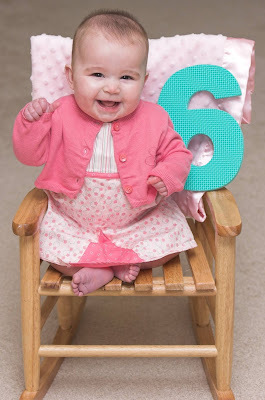 Chasing Proverbs 31: Eleanor is 6 months old! She must have been saving her smile all week for her six month pictures. She's definitely a cutie! What a fantastic picture. And a fantastic age. Enjoy the days while you have them! Eleanor is adorable. Very pretty little lady. I saw you went geocaching. We tried letterboxing for the first time last week, which is similar and had a blast!!! We may start geocaching and doing both, allthough if the kids were allowed to pick a "treasure" to give it might not fit in the box. 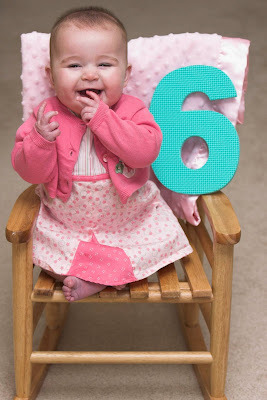 hey - happy 6th month b-day Eleanor! You're a beautiful girl! Hey Megan - you can borrow Karina any time to walk on your back! What am I supposed to read if you only post a few times a week?? Oh my gosh is she cute or what!!! Great 6 month pictures. Loving them.